This week's guest talks about fiction-writing from a different perspective: as an editor. 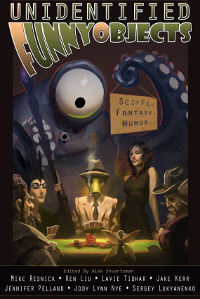 Alex Shvartsman, whose own collection of published science fiction stories would stretch from here to Cleveland if laid end to end, has edited an anthology called Unidentified Funny Objects. He shares with us an insider's view about the difficult task of picking stories from the pile of submissions. This was the mantra of my associate editors and I as we read submissions for Unidentified Funny Objects last year. My stated goal was to collect a wide assortment of humorous stories and to feature a variety of styles and sub-genres that would offer something for every palate. But how to make certain that my personal tastes don’t skew the book toward the kind of humor *I* like at the expense of what other readers might enjoy? In order to build a healthy, balanced collection, I developed a slush system that’s quite different from most publications. Each story we received was read by the first reader (in most cases it was me, only about 20% of the stories were seen by one of the other editors first). The first reader’s job was to look for stories that *might* be a good fit even if they weren’t that reader’s personal favorite. This culled well over 80% of the submissions and left us with a handful of very strong contenders. Each story that made it past the first reader was stripped of any personal information and sent out to 5+ associate editors for evaluation. Anonymity was meant to help the editors judge the story solely on its merit – they didn’t know whether they were reading a submission by a Nebula winner or by a previously unpublished author. Each editor offered a Yes, No, or Maybe vote with some comments. Based on those votes and feedback I either released the story back to the author, held it until the end of the reading period, or (in a few rare cases) bought it immediately because I knew I had to have it for the book. I ended up buying 29 stories out of over 900 submissions. Do you know how many of those 29 received a unanimous vote from the associate readers? None. Not a single one. Because--say it with me--humor is subjective. I don’t truly expect any one reader to enjoy every single story collected in this book. However, I strongly believe that almost anyone will find multiple stories they can love. Both readers and critics have been very kind to the volume so far, sharing this sentiment. Hooray! More historical fiction today! 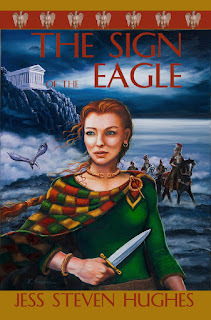 My guest is Jess Steven Hughes, whose YA novel The Sign of the Eagle takes place in 71AD, and deals with the love and law in Ancient Rome, as well as the cultural interplay between Celts and Romans. Jess shares some background on how he came to write this intriguing story. I had always wanted to write, but it wasn't until I was in my early 40's that I started. I was not interested in writing non-fiction. Several factors lead to that realization. At the time I was a police detective sergeant on the Long Beach Police Department in California, and my major in college was Public Administration. However, my minor and academic first love was Ancient Mediterranean History─I have traveled extensively throughout the Mediterranean World. After I had received my Master in the above at the University of Southern California, I asked my Classical History Professor, Dr. David Hood, what were the requirements to teach Classical History? He answered in order to teach you had to have a Doctorate in Classical History, but you also had to be proficient (read and write) in six foreign languages. These included: French, German, Greek, Italian, Latin and Spanish. I had taken only Greek, Latin and Spanish. I decided that I should seriously consider writing historical fiction instead, which was my favorite genre, especially, stories of the Classical Period. Because there are many gaps in the historical timeline, I knew I could write about the Classical Period with greater leeway than many other historical eras. This allowed me to be more creative and imaginative about the events of the time. Before I wrote my first historical novel, The Sign of the Eagle, and the two novels I am currently writing, I had to learn the fundamentals of writing fiction. This included: plot, characterization, scene, setting, dialogue, descriptive narration, the difference between showing and not telling, etc. Only after I had attended writing seminars and workshops for several years did my abilities as an author of novels finally emerge. Always keep in mind, I don't write HISTORY. I use historical events and backdrops for my stories. 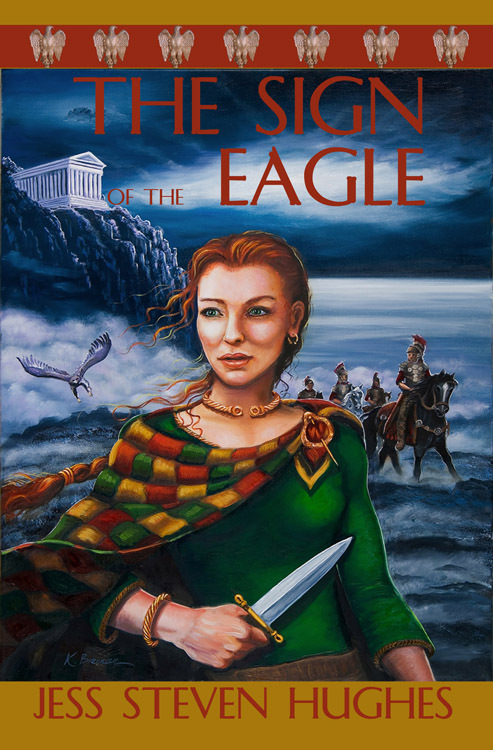 My historical novel, The Sign of the Eagle, published by Sunbury Press (www.sunburypress.com), a traditional small press, takes place in Milan and Rome in 71 A.D. The main character, Macha, is a Celtic woman married to a Roman officer, Titus. He has been wrongfully accused of treason and conspiring to assassinate the Emperor Vespasian. Macha must almost single-handedly prove his innocence. Historians have speculated there were several conspiracies against the life of Emperor Vespasian, but only two appeared to have been recorded as found in The Twelve Caesars by Suetonius or in The Histories by Cassius Dio. Therefore, my story is a fictionalized account of one possible unrecorded attempt on Vespasian's life. He was considered one of Rome's five "good" emperors and my favorite. I wrote from what I believe to be a different perspective using an unlikely protagonist, a Celtic woman. Why not? Before I could fully develop The Sign of the Eagle, I had to conduct extensive research. For this I turned to my private library over 500 books on Classical, Celtic, and Mid-Eastern history. I started with the overall history of the Roman Empire and the Celtic world. I continued with geographical locations narrowing down the story to Milan, Rome and the Italian country side. I had to consider historical events that occurred prior to those in my novel which were important to the story's background. Among these I included the great civil war of 69 A.D. known as the Year of the Four Emperors (Galba, Otho, Vitellius and Vespasian). In my story, Macha's husband, Titus, fought in this war against the forces of the short-lived Emperor Vitellius at the Battle of Cremona. Titus was part of one of Vespasian's advanced units. Other events included the invasion of Britannia in 43 A.D. and the eventual capture of the British Chieftain, Caratacus, Macha's father. He was brought to Rome along with his wife and Daughter and ultimately pardoned by the Emperor Claudius. We don't know the daughter's actual name, I chose a good Celtic name, Macha. Caratacus was ultimately pardoned and disappeared from history, but there was no reason why I could not use his daughter for a story. For her background, I described her growing up being Romanized but clinging to many Celtic customs. Prior to the story, she married Titus, who was a born in Rome. His parents were Gauls, but his father was a Roman Senator, one of the first Gauls admitted to the Senate under the Emperor Claudius. Because I used a Celtic protagonist, I had to research Celtic as well as Roman customs re: daily living, the role of women in the Celtic and Roman worlds, the gulf between the classes, slavery, etc., religion, the military (Celt and Roman), descriptions of city life, especially, in Rome, etc. It was only after I had conducted sufficient research that I wrote my story. However, I wasn't finished. I had to run the gauntlet of two writers groups, the Spokane Novelists and the Spokane Valley Writers Group which month after month reviewed and bled all over my chapters until the manuscript finally met their expectations. Even then I wasn't through, I sent my manuscript to a "Book Doctor," an editor who had spent many years with Harper-Collins before going into private business. Fortunately, she is a very ethical person (there are some real charlatans out there) who was very thorough and answered all my subsequent questions after she had reviewed and returned my novel for more work. My efforts paid off. After many rejection slips, The Sign of the Eagle was accepted for publication. Learn more about Jess Steven Hughes at his website. You can purchase The Sign of the Eagle from the publisher, on Amazon, and at Barnes&Noble. I'm in a tizzy, to use an old expression. I have four novel-length works in progress. That in itself is not unusual for me. What's weird is that, this time around, there isn't one work that's truly leaping forward, causing me to forget the others for several months while I finish it. After I finish a novel, I usually have a couple weeks of this state of confusion. But it's lasted a couple of months now, and I'm getting concerned. I have at my fingertips four works with very different purposes, which is making it particularly difficult to choose. And I think part of my problem is that I'm shying away from the bigger challenge, yet part of me knows I should embrace the challenge. 1. A second sequel to my humorous (adult) sci-fi novel, Green Light Delivery. I think of this as the easy path, since I'm accustomed to the characters and world they live in. This is fully plotted and fun to work on. 2. A sequel to the middle-grade historical I'm currently shopping to agents. This is embryonic, with only a bit of research and plotting done. My main interest here is to have something available if and agent/publisher is interested. 3. A serious YA sci-fi, which I've been working on for two years. I really like the concept of this, but it's very complicated and some days I get exhausted just thinking about it. If I do this, it must be done right. I have about 12K words written and a full plot outline. 4. A very personal, long, mixed-genre piece that's my "desk-drawer novel," coming together slowly over the past five or six years. It's scary because it's the biggest emotional investment. Because of its topic, it's rather time-sensitive. I also know it will be an extremely hard sell, but it means a great deal to me to push it out into the world. And the wonderful, open-minded sci-fi publisher I work with (Candlemark & Gleam) may be my only chance ever to get someone even to consider it. Eventually, I'll figure this out and commit to one work. Have you ever had this issue, not being able to decide what's the best thing to dive into with your whole heart and mind? For more info on my published novels, please visit my website. Kelly Hashway is one of the most prolific fiction writers around. I was honored to have her as my first guest on this blog back when her picture book May the Best Dog Win was released. But Kelly also writes YA paranormal novels. Touch of Death came out last month from Spencer Hill Press. Today Kelly discusses why paranormal stories have a special appeal for teen readers. I grew up with an older sister who loved vampires and anything dark. Who knew she’d rub off on me? But she introduced me to The Phantom of the Opera, Nightmare on Elm Street, and of course Halloween. She and her friends would watch scary movies after school and I’d sneak in to watch from the doorway. I’m still terrified of dolls thanks to Chucky, but I couldn’t get enough of all things paranormal. And soon enough, I was watching shows with everything from vampires to werewolves to ghosts. There’s a part of me that thinks I was born to live in a world of paranormal beings. Maybe that’s why I create them in the books I write. The great thing about paranormal (and horror) is that it’s like our world, only intensified. Every feeling, every emotion, is heightened. The genre seems to prey on emotions, and I’m an emotional person. I love being scared because it’s such a strong feeling. The feel of your heart racing, the sound of your pulse in your ears, the chills of goose bumps running down your arms and legs—these are things we can all relate to. So when I write, I aim for that. For something that will grab the reader’s emotions and not let go. I want my characters and story lines to be memorable, and memorable in a way that makes my readers experience the emotions in my books. Why do I think teens are drawn to the paranormal? Simple. Teens have emotions like none other. When you’re a teen, everything is intensified. Everything feels like life and death. I envy how strongly teenagers feel. I miss that. Writing YA and especially in the paranormal/horror genre lets me feel that again. I can relive how scared I’d get watching horror movies at night. I remember walking to my car after work late at night and doing double takes at every shadow in the parking lot. I need all those fears and emotions in me in order to convey them in my writing. You can’t show what you’ve never felt, at least not in a way that will make readers feel it, too. Paranormal has become extremely popular over the years, and I think it’s made a lot of adults turn to young adult fiction. It unites people of all ages because of the emotions it evokes. And I can’t think of anything better than bringing adults and teens together because who among us really let go of his/her inner teen? I know I haven’t. Learn more about Kelly Hashway on her blog.